The CBSM Beach Camp is for Middle Schoolers Only (current 6th – 8th graders). The purpose of this trip is to train our middle schoolers in the gospel, evangelism, church planting, and missions. The mornings will be spent doing missions projects, the afternoons we’ll be at the beach and pool, and the evenings will be worship/training sessions. Payments: Non-Refundable $125 deposit due Sun, March 17. Final $200 due Wed, May 22. 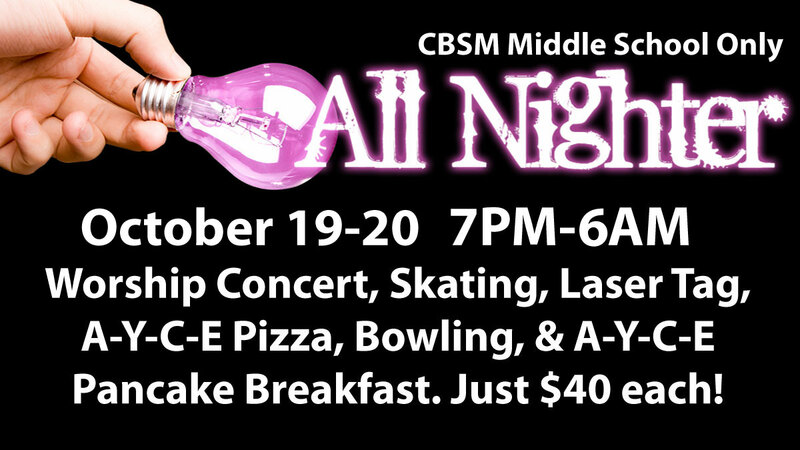 Our Middle School All-Nighter is October 19-20 from 7pm – 6am! We want all of our middle schoolers to come, and to invite all their friends. CBSM has had tons of all-nighters and they are always amazing! So do whatever you have to do to not miss this. The schedule is below and the cost is only $40 which is crazy low for all we get to do! So make sure to turn in your registration form and $40 by Wednesday, Oct 10th along with all your friends’ stuff, too! I literally can barely believe this is happening! God has grown our student ministry to the point that we don’t have any other choice. We absolutely have to go to 2 ministries within CBSM. Our events, worship services, etc. have gotten too big to handle. So now, we are having to move to 2 ministries so that we can specialize in each age group. 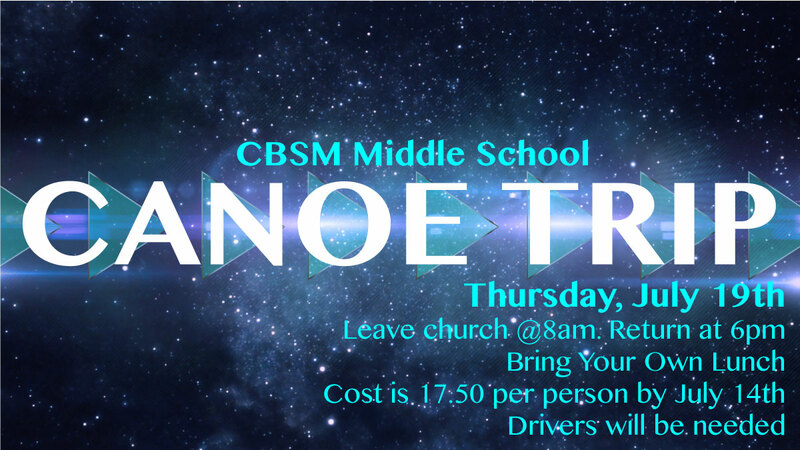 That’s right…its time for CBSM Middle School and High School Ministries. Oh, and by the way, we’re not dividing or splitting up these ministries. But we are multiplying into these two ministries. That’s key wording for this awesome move of God! Here’s how its going to breakdown. Beginning August 7th: Small Groups at both 9:00am and 10:30am on Sunday mornings. Beginning August 14th: Worship Service at 6:30-7:45pm on Sunday nights. Beginning August 14th: SMT’s (Student Ministry Teams) at 6:30-7:45pm on Wednesday nights. BACK TO SCHOOL BASH: Sun, August 21st! 4 – 6pm: Tons of Inflatable Games, Food, Etc. 6:30 – 8:00pm: Epic Worship Service. Beginning August 14th: SMT’s (Student Ministry Teams) at 6:30-7:45 on Sunday nights. Beginning August 17th: Worship Service at 6:30-8:00pm on Wednesday nights. BACK TO SCHOOL BASH: Wed, August 24th! 6-7:30pm: Epic Worship Service. 7:30-10pm: Bonfire, Food, Chillin with Friends. So there you go. There’s our breakdown. We can’t wait to see everything that God is going to do in our lives, ministry, and church through this growth. Keep focused on Jesus through all this, reach the lost, invite the unchurched, and lets attack hell with the truth of the gospel!